As the cooler temperatures start to make their appearance, all those favorite summer appetizers like chips and guacamole are starting simply not to cut it any more. This time of year we start craving something a little warmer, creamier, and decadent. However, we still aren’t looking for something quite so heavy as cocktail meatballs or cheese dip. 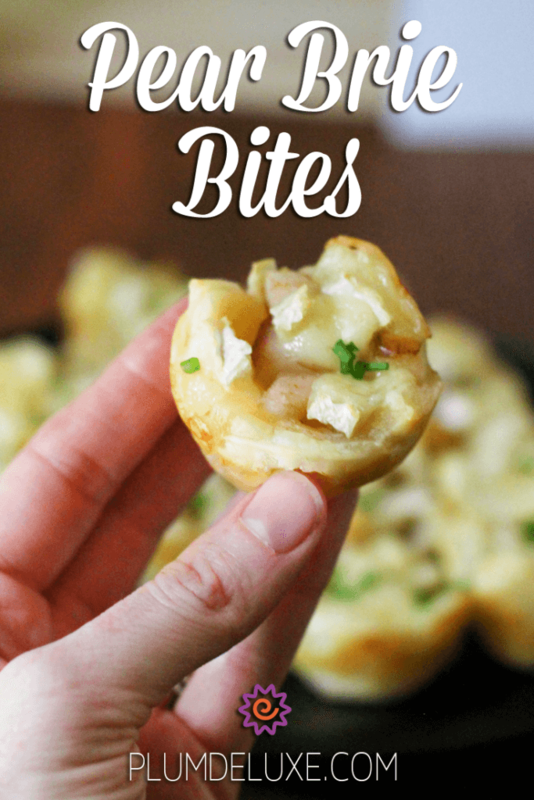 That’s where these amazing pear brie bites come in. 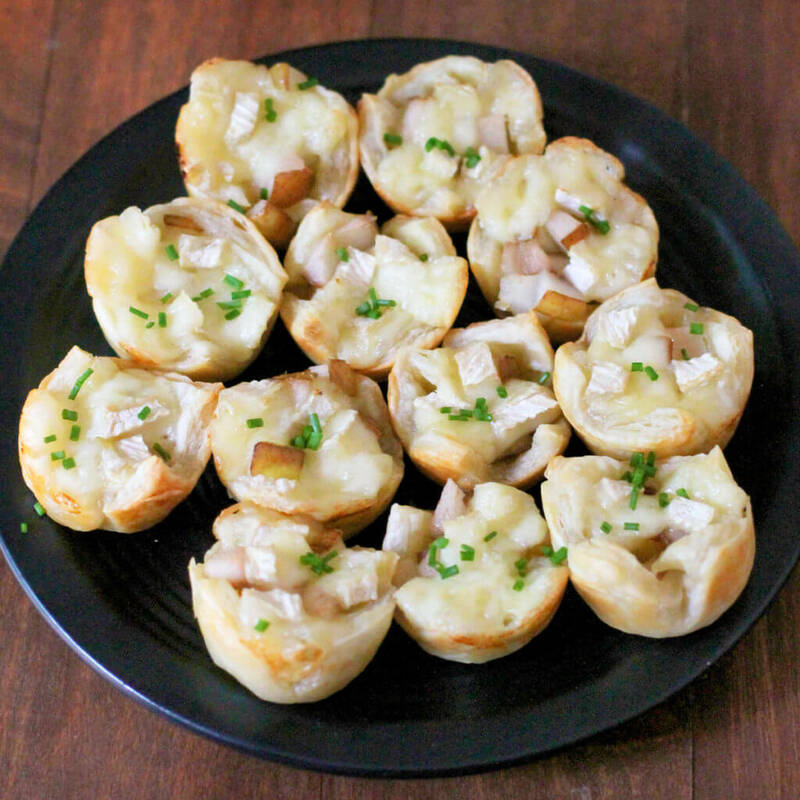 Made with only a handful of ingredients, these pear brie bites are a great addition to your quick and easy fall and winter appetizer rotation. It takes only 20 minutes to put these little guys together, but they give off an air of upscale dining that both you and your guests will love. Brie is a delightfully creamy and buttery cheese that is mellowed by the freshness of the fruit. The hint of brown sugar keeps the fall theme and adds a hint of much-needed sweetness. All of this is encapsulated in a gloriously flakey puff pastry crust that is easy to pick up and eat one handed. The great thing about this recipe is that it’s very adaptable. Pear can easily be swapped out for apple, or preserves in the winter. Honey, maple syrup, or balsamic vinegar are all great options to replace brown sugar. However, keep in mind that if you’re using preserves, you probably won’t need the added sweetness of sugar anyway. Similarly, changing out the herbs based on what’s available is a simple and easy way to brighten up this recipe. We used chives, but basil, sage, and cinnamon all have very unique qualities that would go great with these little bites. Also, with these subtle changes you can serve this same appetizer time and time again without boring your guests. 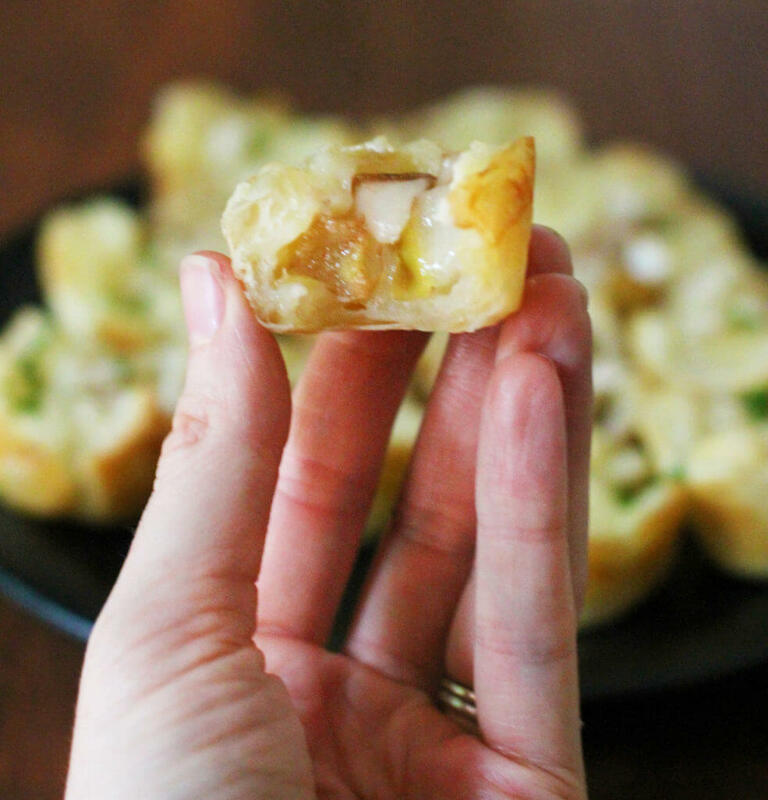 For more ideas on quick and easy appetizers, check out these three awesome party snacks. They are all super easy to put together and sure to please a crowd. If you’re planning on using these bites as part of a tea party menu, we definitely suggest trying them with our Afternoon High Tea with its notes of peach and pear. On an especially chilly day a nice chai, such as our Full Moon blend, is another great option. Preheat oven to 400 degrees F, and lightly grease a mini cupcake tin. Roll out the puff pastry and cut it into roughly 2-inch squares (roughly 20 squares). Place a puff pastry square in each cup, and place in the oven. Bake for 10 minutes. Remove from heat and poke the center down with a spoon. Fill each cup with equal amounts of pear. Do the same with the brie and top with a sprinkle of brown sugar. 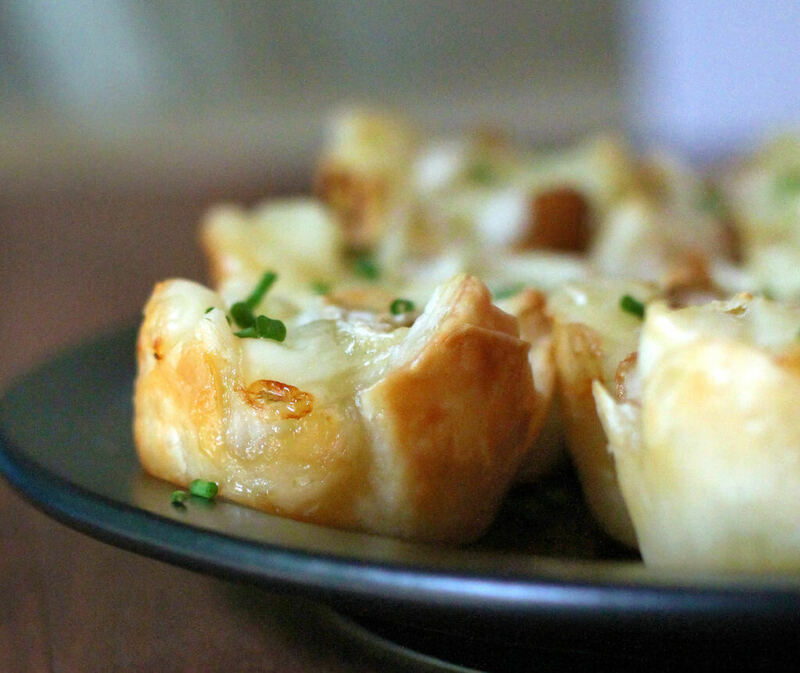 Place back into the oven for 5 minutes or until the brie is melted and the cups browned. Remove the cups from the tin to a serving tray, and garnish as desired. JC is from Upstate NY and is the blogger behind Sweet Love & Ginger. She believes in celebrating a healthy lifestyle and can be found enjoying the great outdoors, crafting, cooking and entertaining.